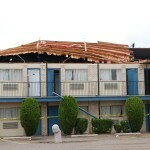 After storms have pelted Texas with wind, rain, and hail over the past few months, contractors from all around the country are coming to places like Fort Worth and Wylie and placing signs and ads for homeowners and business owners seeking to repair roofs. In some instances, they are offering to waive or rebate deductibles, such that property owners would not have to pay anything to get a brand new roof. No deductible, and a new roof? Sound too good to be true? It is, and it’s illegal. When a property owner receives money from a property or casualty insurance policy to repair damage, it is illegal for a contractor, or anyone else providing services to pay or rebate the insurance deductible, if the contractor is also inflating the cost of the repair to make up for the deductible. While this seem like more of a problem for the contractor rather than the property owner, section 27.02 of the Texas Business and Commerce Code makes it illegal for an insured policyholder to participate in this practice. If the insured agrees to submit a claim under a policy knowing that the deductible has been rebated and the charges exceed what is customary in order to make up for it, then the policyholder can be in a lot of hot water. This problem doesn’t stop with contractors who are operating outside of the law. In fact, some insurance companies seem to be encouraging this illegal practice, if not outright participating in it. Certain insurance companies are now offering to waive a deductible for a property owner if they will consent to use the insurer’s preferred contractor to do the repairs. This is often called a preferred vendor program, and it raises significant legal concerns. Oftentimes these preferred vendors have the insurer’s best interests in mind rather than their own client’s. They will do whatever the insurance company tells them to do – or not do – on repairs, rather than what is necessary to do the job right for their customers. When insurance companies offer to waive a deductible in exchange for an owner working with a preferred vendor, it may sound tempting for many consumers – but it’s often a trap for consumers, as the preferred vendor will do a lesser scope of work just to save the insurance company money. And when insurance companies sweeten the pot by offering to waive a deductible, they are not only harming consumers with their preferred vendor programs, but they appear to be breaking the law as it is written in Section 27.02 of the Texas Business and Commerce Code. If it sounds like it’s too good to be true, it very well may be. Consumers can avoid this problem by researching contractors and learning more about who they are and what their other customers say about them. There are many legitimate contractors who operate within the requirements of the law, and it’s important for consumers to only do business with contractors who follow the law. Policyholders might be anxious to get damage repaired as soon as possible, but it’s important to do the proper research before hiring anyone to fix the damage. If you are ever in doubt, contact a licensed public adjuster or an attorney for advice. If your commercial property insurance carrier has denied, delayed, underpaid, or disputed your insurance claim, the experienced Texas insurance litigation attorneys at Raizner Slania can help. Please contact us today for a free initial consultation. We handle all bad faith insurance litigation cases on a contingency fee basis, meaning you will not pay attorneys’ fees unless we help you recover on your claim.